The 9/2 favourite stalked the pace under Harry Bentley before being unleashed with a furlong to travel and his brilliant turn of foot saw him immediately burst clear of the rest of the field. David O'Meara's 25/1 outsider Suedois was prominent throughout and stuck to his task really well in second, while third went to Karl Burke's Commonwealth Cup-winning filly Quiet Reflection at odds of 7/1. 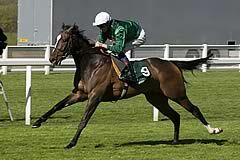 Candy, who also saddled the disappointing Twilight Son, said: "He's exciting and absolutely amazing to watch. "He does give the jockeys that ride him the most fantastic feel. "I would think he'd stick at this trip. It would be rather fun if he ran in the Sussex (Goodwood). I wouldn't rule it out totally - it's a thought. "I thought he ran a cracking race in the Lockinge and I thought he settled very well. My horses weren't right at the time and I thought he got the mile that day. "I've been training him pretty much to stay. We had the Summer Mile very much in mind and the Lockinge Stakes earlier so I have been learning him to try to settle as much as possible. "This week, though, I've been trying to get the fizz out of him and get him to enjoy himself. "Twilight Son was on the outside. Both were easy to spot, so I was able to watch them both. Martin Harley (Twilight Son's jockey) said he was never comfortable. It was a bad decision (to run him) by me. "I thought it would be just OK, but Martin said he was never comfortable." Bentley said: "I got in a great position and he took me there almost too well. I knew in the back of my mind he does get further than six (furlongs), but he's got so much natural speed. "This is an amazing opportunity. To get a ride like him in a Group One is so, so special." O'Meara was equally thrilled with the runner-up who he felt took another step forward on his previous form. O'Meara said: "We're delighted with him and that's an improvement again. He's obviously come up against a very good horse in Limato but we're delighted with the performance. "He's very versatile on the ground really, it's not that important to him. "We'll perhaps be looking at Haydock (Sprint Cup) a little later on and maybe the big race over in Deauville (Group One Prix Maurice de Gheest)."